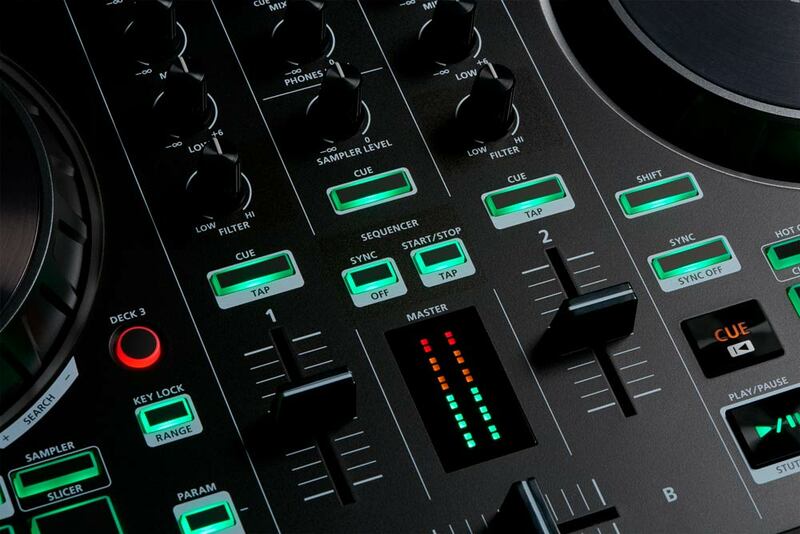 With the new DJ series Version 1.10 firmware update, Roland’s acclaimed DJ-808, DJ-505, and DJ-202 DJ Controllers are now more powerful than ever. The update adds a host of features, including many based on requests from DJ series owners. The added features are specific to each model, and include enhancements like new TR-S drum sounds, more kits, new effects, enhanced performance controls, and more. Roland DJ-505 (left) and DJ-202 DJ Controllers. If you’re the owner of a Roland DJ-202 or DJ-505, our new series of informative videos will fast-track your knowledge and help you become familiar with a variety of commonly used of functions. Topics include real-time and step recording, changing TR kits, using effects, working with external MIDI devices, and more. There are also overview demos that showcase the primary elements of the instruments. All the videos are brief and easy to follow, so you’ll be creating great music with your DJ controller in no time! And if you’ve been thinking of purchasing one, you’ll get an inside look at what these powerful creative instruments can bring to your setup. Roland DJ Controllers: DJ-808, DJ-505, and DJ-202 (left to right). Offering intensive real-time control and deep Serato DJ integration, Roland’s DJ-808, DJ-505, and DJ-202 DJ Controllers unlock exciting new approaches to music performance. To enhance your creative flow, we’ve created four free sample packs for Serato DJ that work seamlessly with your Roland DJ instrument. Each pack contains eight high-quality WAV samples newly created by Roland that are ready to load into Serato Sampler, expanding your performance options with sounds from popular genres that can be sequenced and mixed into your DJ sets. For a limited time, purchase a Roland DJ-202 controller in the U.S. and receive a free bundle* worth more than $200. The new U.S. DJ-202 bundle includes an upgrade to Serato DJ ($99), a free 90-day BPM Supreme Standard membership ($59.97), and access to free DJ-202 Roland Cloud Academy training ($100+ value per training session). Anyone aspiring to start making music right now can easily make it happen, and the DJ-202’s full potential can be cracked wide open with this great deal. On September 19, 2017, the influential British publication DJ Mag is streaming their annual DJ Mag Tech Awards event live on YouTube, and we’re pleased to announce that the DJ-808 DJ Controller has been nominated in the Ultimate DJ Controller category. Our groundbreaking DJ instrument will square off against four competitors at 10:00 a.m. EDT/7:00 a.m. PDT, with live demonstrations presented to a judging panel comprised of leading DJs and producers. Make sure you rise early—or stay up all night—to check it out! Subscribe to the DJ Mag YouTube channel now to watch the event. Visit the DJ Mag site for more info on the 2017 DJ Mag Tech Awards categories and judges. Roland Cloud Academy is pleased to offer a great new support opportunity for all DJ-808 owners. Through an ongoing series of free live training sessions, you can learn all about the DJ-808 and its tight integration with Serato DJ software. Hosted by expert instructors, the in-depth sessions cover everything from basic concepts to advanced performance and production techniques. Read on to learn more about the training and how to register.